The very first thing people do when they step foot in Las Vegas is whip out their phones and start to take photos of everything... especially themselves. And most of the pics that don't get instantly deleted end up on Instagram. So which places are "liked" and tagged the most? We used highly exhaustive scientific research and data to figure out the 21 most Instagrammed locations in Vegas. And yes, Wet Republic really is less popular than the airport. The Cosmopolitan's nightclub has a pool area that is covered by a dome for the cold winter months, offering even more opportunities for getting those "likes." The most sprawling nightclub in Vegas has three different floors, a lounge, and even an eponymous restaurant next door. If it only had an outdoor patio, it might move up a few places on the list. Need an atrium full of flowers? Or a fully functional volcano outside the front door? It's got it. At least the Kardashian retail shop is long gone. It's almost worth putting up with the tyrannical security check at the entrance for the drinks, DJs, and if you get around to it, maybe a little bit of actual swimming. This pool and party area is perfectly designed for Instagram, namely the crazy view of the Strip from the rooftop of The Cromwell hotel. 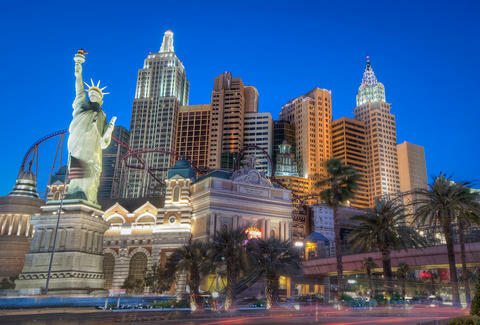 One of those Las Vegas resorts that has a bit of everything, including restaurants like StripSteak, nightclubs like Light, a Cirque show based on Michael Jackson, an 11-acre beach, and a convention center like, uh, the Mandalay Bay Convention Center! Another nightclub. Another pool. More DJs. More bikinis. And stripper poles. Be sure to choose your filter wisely. The phony Statue of Liberty out front was once at the center of a lawsuit when it was used in place of the real thing on a postage stamp. Take a pic but don't stick it on an envelope. One of the most in-demand nightclubs in Vegas has big-name DJs like Skrillex and is packed with hot people in bathing suits, especially during its weekly Nightswim event by the pool. You need evidence you were actually here. Not to be confused with Street League Skateboarding, the place formerly known as the Sahara is trying its best to rejuvenate the north end of the Strip. Even the dudes at the Irrigation Show & Education Conference are snapping 'grams! Nothing says you've arrived in Vegas... like actually arriving in Vegas. But the best part is definitely the slot machines in the terminals. Chances are pretty good that the audience that goes to see a Britney Spears show is more likely to be on their cellphones taking photos than any other crowd in Vegas. You could be taking a picture of your plate of escargot at Bardot Brasserie or the 24ft-tall waterfall outside by the valet area... or you can just wait until Jewel Nightclub opens and take a photo there too. People love to take photos of the Roman statues in the lobby, but the cellphone cameras really come out underneath the moving chandelier at OMNIA nightclub. You wanted to go see the real Paris but it was too expensive. Here is, naturally, the next best thing (and the plane tickets are a lot cheaper). So yeah, the lobby is loaded with flowers. It's cool. But do you really need to take a photo every 5ft? Take a photo of a) the gondola ride, b) your plate of fried chicken and watermelon at Yardbird, c) that girl who gave you her number at Tao, and d) that girl who gave you her number at Rockhouse. Now post them all to Instagram to show how well fed and popular you are. It's hard to not want to snap a pic while enjoying a drink at the three-story-tall Chandelier Bar, although it seemed like everyone had a photo to post on social media of last year's massive but injury-free fire by the pool. Take a photo with the statue of the lion outside the hotel or with the statue of the lion by the check-in counter inside the hotel. Do not leave until you find a statue of a lion to take a picture with. This one should come as no surprise. Between the iconic fountains out front and the conservatory & botanical gardens in the lobby, it's hard to walk 2ft without stepping into someone's camera shot. Rob Kachelriess joined Instagram for the sole purpose of finding photos for this article. Follow him on Twitter: @rkachelriess.